IUT IMS-analyzer monitoring solutions cover a wide range of industries and compounds where ultra-low detection, rapid response and alarm, continuous monitoring and low maintenance are required. This includes both indoor and outdoor applications where hot/cold and wet/dry conditions will occur. Whether monitoring for worker safety or production control the IMS-analyzers have the lowest maintenance requirements while continuously monitoring the most difficult compounds. The typical ranges of detection are from ppt to percent levels, insuring detection in time to avert a critical event. IUT designs and manufactures IMS, GC-IMS, PID, GC-PID and EC analyzers specific for the industry and application, so you can be assured your workers and production environment are continuously protected. The ion mobility spectrometry (IMS) is an analytical technique to separate and therefore to identify ionized molecules in the gas phase. The IMS-Analyzer is a multi-gas analyzer as Ion Mobility Spectrometer (IMS) with high sensitivity in the lower ppb-range and high resolution. 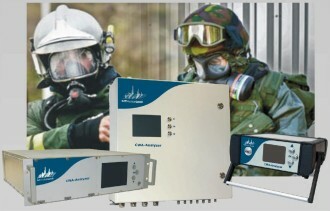 With this trace-gas analyzer toxic gases can be detected and identified without any enrichment directly in situ already at a very low concentration level.